2018 marks the 40th Anniversary of Eight-Hooter® calls, as well as my 45th spring in the turkey woods. After 18 years in the great state of Missouri, one of the nation's top turkey hunting states and home to many call-makers, we relocated to Pennsylvania in 2014, another renowned state for turkey hunting and call making. My turkey calls are made "In the Classic Callmakers' Tradition"™, one at a time, using only the finest materials available. 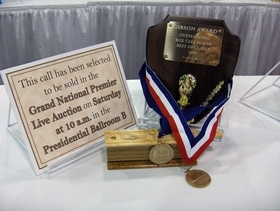 These calls have won numerous awards over the years at the National Wild Turkey Federation callmakers' competition; held yearly in conjunction with their National Convention. Although my box calls are carefully handcrafted using native and exotic hardwoods, I build each call to be taken to the turkey woods and used as a precision hunting tool. This is not just another pretty call! After 45 years of wild turkey hunting, you can be assured, no call will leave my shop that I wouldn't hunt with myself.